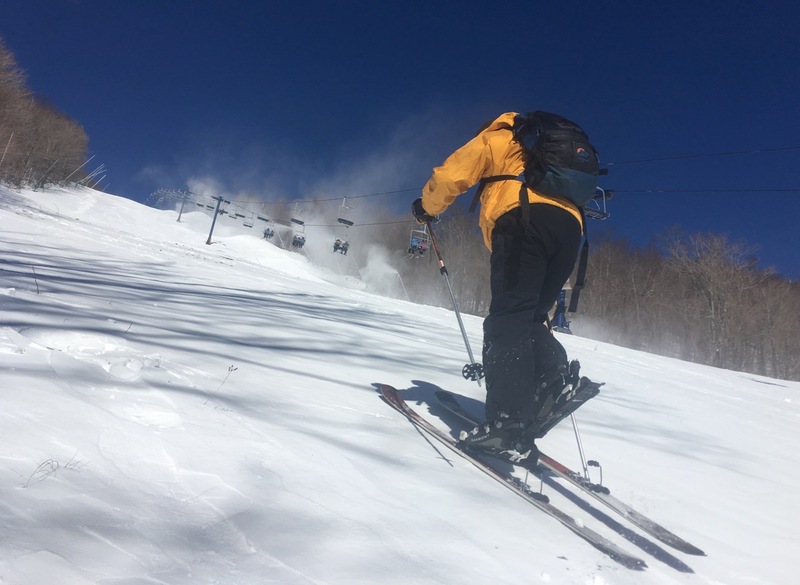 Anybody that’s been paying attention to the evolution of skiing the last couple decades couldn’t help but notice the steady growth in popularity of uphill skiing. I’ve thinking about jumping in too. I have this vague idea that my mid-life crisis will involve the backcountry and I’m trying to prepare. A few years ago, with an EMS gift card burning a hole in my pocket, I picked up a pair of Petzl Alpine Trekkers. 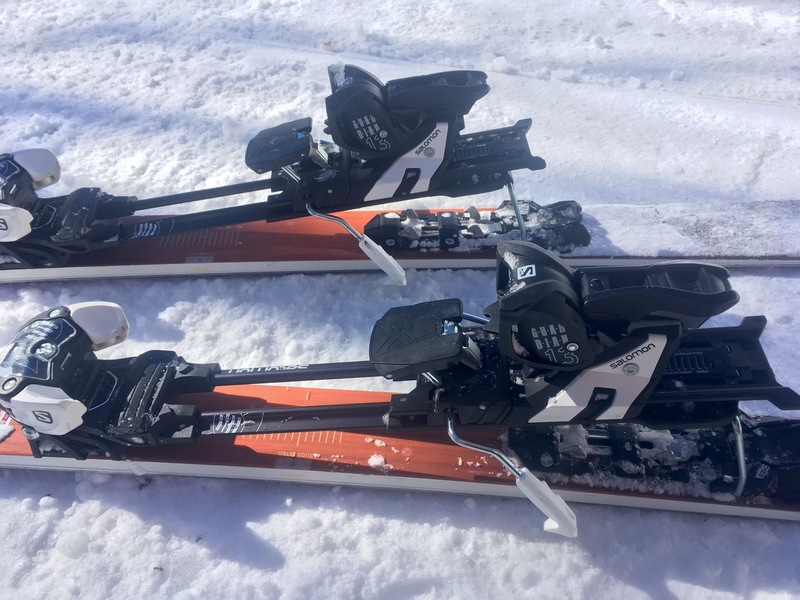 These are hinged devices that click into regular alpine bindings that allow you to get into the game at a relatively low cost. I grabbed a pair of factory blemished climbing skins from Sierra Trading Post and I was off. The trekkers were adequate for exploring defunct ski areas and climbing small hills in nearby state parks. Still, even on those limited excursions, they weren’t ideal. They have a high center of gravity and getting in and out of them adds a lot of time to the transition from uphill to downhill. I started considering real gear for side or backcountry adventures. I picked up a set of adjustable poles and when I came across a too-good-to-pass-up deal on AT boots, I grabbed them. This past fall when I sprung for a new pair of skis, I mounted them with AT bindings. 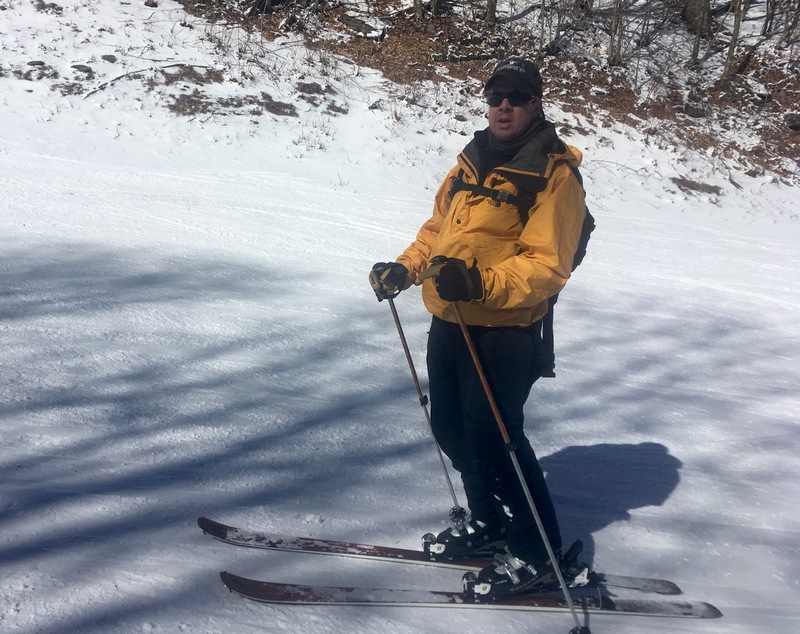 The vast majority of my skiing is still inbounds and lift-served. But now, when the hills near home have snow, I’m able to get out and explore more easily. After learning to use my new gear close to home, I just couldn’t resist trying them out at a resort. While my kids were riding the lift, I pulled out my skins, unlocked my heels and got a great workout. My past efforts have been a few hundred vertical feet on mellow slopes. Pushing up 1000 feet on the steeper runs at Plattekill was a whole different thing. Temps were barely in the teens but very quickly I was opening ventilation zips and swapping my helmet for a baseball cap. I still have a lot to learn. 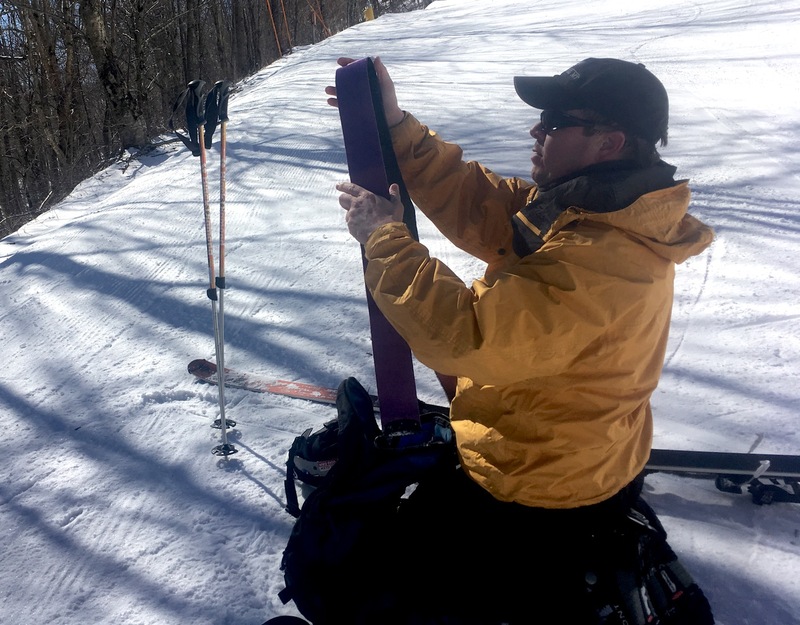 I found that when skinning up the steeper sections it was important to keep the skis in contact with the snow even when sliding forward. I didn’t realize I was picking my feet up until I lost traction a few times. In spots, I had to zig zag a little; I wasn’t sure if I was trying to go up something too steep or if it was due to poor technique. Once, I got tangled up and fell over, just as my son went overhead on the triple. Junior got a kick out of that and yelled “Brownski is downski!” Thanks kid. Still, I made pretty good time. Previous explorations closer to home had helped me with my transition skills; I got my skins on and off easily enough. Granted my kids got three runs in the time it took me to get one but that’s part of the game. I’m looking forward to traveling in a new direction. Skinning has opened up a whole new aspect of the sport for me, too. I live in New York City, and once or twice a year I drive over to Mountain Creek to skin laps for a day. It takes about 25 minutes to get from the bottom to the top, a few minutes to transition, and less than two minutes back down. Five or six of those laps do me in for the day. Another great way to get in some skin-time: those “wasted” mornings on the last day of a ski trip when you don’t have enough time to ski, or don’t want to invest in a full day lift ticket when you’ve only got a couple of hours. (This happens to a lot of us east-coasters when we ski out west and lose 2-3 hours just in the time difference). Drag yourself out of bed early, skin a lap of two, and head for the airport. At a big mountain like Vail, you’ll be skinning for two hours just to get to the top of the first run. Two bits of wisdom if you want to give this a shot: (1) make sure the resort allows uphill travel (some don’t, and some do but restrict the time of day or runs you can use; and (2) if you’re going to do lots of short laps (like at Mountain Creek), learn how to take the skins off without taking your skis off. It’ll save you a ton of time and frustration, especially if you tele and don’t have step-in bindings. There are videos on YouTube. I’ve even seen people put their skins ON without taking their skis off, but that’s some serious Kung Fu right there. If you keep at it, it will change the way you look at the sport. It opens up so many more options and experiences! Good work Brownski! I liked Juniors trail report the other day. 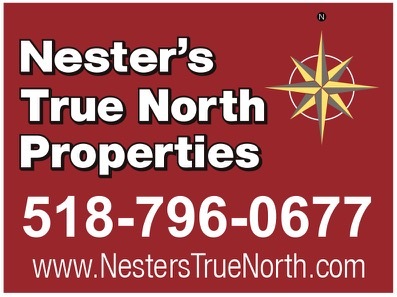 Your family has a good thing going there keep it up. Next season I’d like to hook up with you as a novice skinner myself. I have guardian AT bindings and looking for new boots now. You’re on the verge of an almost entirely new sport. I’ve done enough bc and semi-bc (cut trails on big and biggish mountains, versus open bowls, slides, ravines) to know its allure. Resort skiing has its place, but bc is what I long for these days. I’ve been using tele gear but with a knee condition find I need fixed heels and am considering taking the AT plunge, probably with new-technology tech bindings, like the Kingpin. Keep at it, and maybe I’ll see you out there! I started this year as well. I have been skinning up whiteface. It would be easier during skiing hours. the hardest part is waking up. In Europe I was shocked by the amount of people skinning up.. If you still consider it pain, you’re not there yet. Nordic skiers appreciate the up and the down. Nice one Brownski. Us Albas have considered getting touring kits though we are not sure what kind of frequency we would get to tour. We had looked into adapters that you can outfit to your normal binding and said to ourselves that it might be best to wait until the kids are old enough and all get proper touring set ups. For now, we will just use the lift for backcountry access. We agree with RA – that ski touring will make you look at the sport differently. One day soon for us for sure.